Below we discuss the top 10 dog shampoo brands that cater to different needs of your dog. The brands in this top 10 dog shampoo list are compatible with different skins and coats, pH balanced specifically for dogs, preserve the natural oils, and anti-allergen properties. Some are even environmentally friendly! From the #1 best selling dog shampoo to the best organic shampoo and the best for dogs with sensitive skin, we’ve got them all listed here! Let’s review the best selling top 10 dog shampoo brands available! SynergyLabs Vet Formula Clinical Care is the best selling dog shampoo online. SynergyLabs specializes in grooming and hygiene products that are manufactured in their state of the art plant with the utmost care and perfection. This is a company that is widely known as the ‘thinkers’ in the field of all your veterinary needs and pet grooming products. They are consistently engaged in conceptualizing, visualizing new products and enhancing the existing ones according to the ever-changing needs of their customers. The products from this company are well balanced between natural and chemical ingredients. This makes an ideal choice for dogs that are always rolling on something stinky and needs to be cleaned without being too harsh on their fur or skin. This pet shampoo contains oatmeal and aloe to fight skin irritation, promote healing and moisturize dry skin. 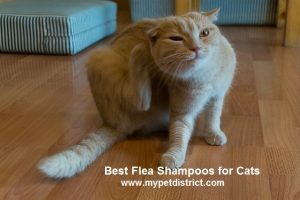 It will also not wash off topical flea treatments. With an incredible 2,570 customer reviews they maintain a 4.5 star rating on Amazon. This speaks volumes about the quality of their line of products. If you are looking for an environmentally friendly pet shampoo, look no further as Earthbath products are biodegradable and cruelty free. This is a Logic Company product which caters to all your dog grooming needs. Their products are non-toxic and paraben free. Logic company shampoos are made of natural materials and are sourced from plants. This shampoo is eco friendly and safe for all breeds of dog, large or small. Plant based formula is effective in getting rid of bad odors and provide great deodorizing properties as well as a refreshing smell. The ingredients which they use to make their products are all natural derivatives obtained from plant sources. The shampoos from BarkLogic, are made in such a way that it doesn’t cause irritation or inflammation to your dogs eyes and nose. It is super safe to use on your dog as it is free of chemicals such as parabens, DEA, PEG and Phthalates. Wahl Home Products are well known for their range of pet grooming and hygiene products. Their dog shampoos come in a wide variety of formulas for all your dogs needs including calming, whitening, shed control and flea and tick. 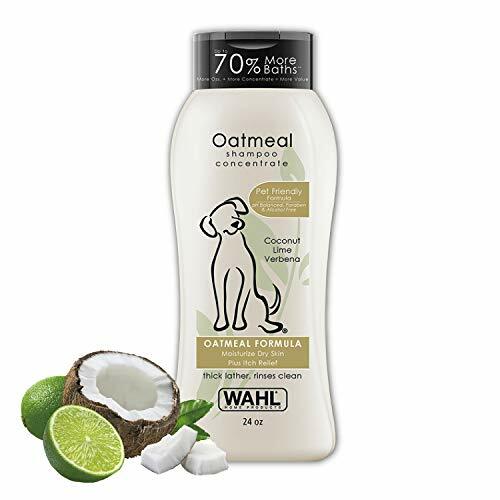 Wahl dog shampoo also comes in an oatmeal formula. They are also keen to keep their products as natural as possible. They offer a wide range of products with different formulations and fragrances that caters to the different preferences of both the dog and its owner. All of the ingredients of the grooming products from Wahl are derived from natural sources. This helps in retaining the natural oils in the skin of the dog, thereby keeping the same safe from skin and fur related issues. Their range of products is guaranteed for being free from any harsh chemicals. Wahl dog shampoo is safe to use on puppies and comes in a larger size than competing brands. It is also concentrated meaning you can get up to 70% more baths when using Wahl’s dog shampoo. 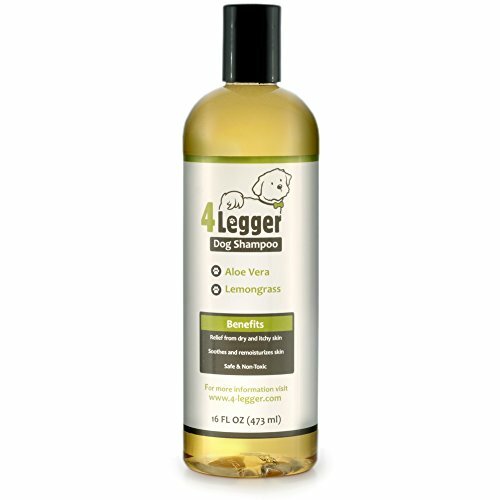 4-legger products are free from toxins usually found in other pet grooming products. 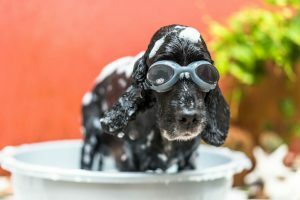 This is another one of our top 10 dog shampoo picks that is not only good for your pet, but is also environmentally friendly. 4-legger products are 100% USDA certified organic with no detergents, parabens or sulfates. Their products are also biodegradable, vegan and cruelty free. 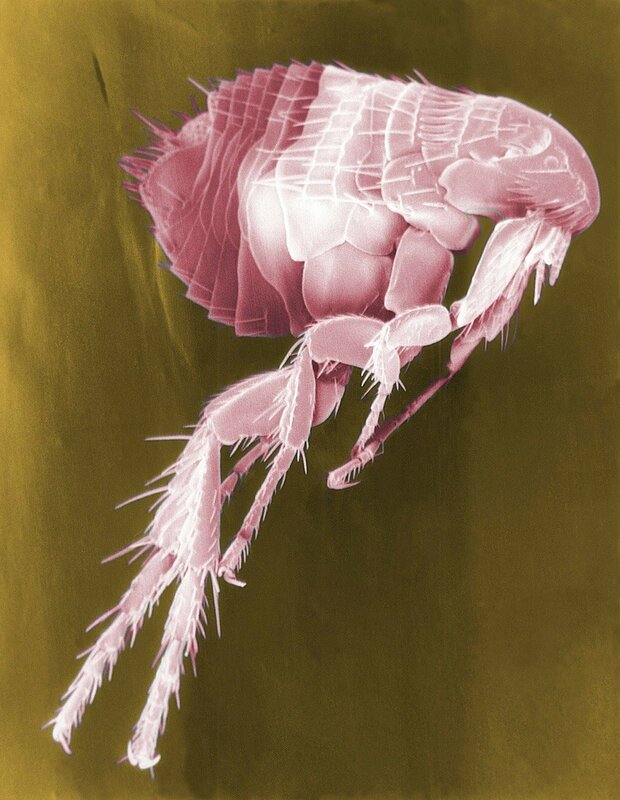 Fleas are repelled by using the natural lemongrass scent. 4-legger shampoos are making a name for themselves with vets and groomers due to their moisturizing and compatibility with the sensitive skin of dogs. All natural ingredients like coconut oil, shea butter, jojoba oil along with essential oils from lemongrass and rosemary, add to the appeal for 4-legger products. Visit 4 Legger for tons more healthy and safe products for your pets. View their products here: 4 Legger. The Oxgord dog shampoos are very popular, offering their furry clientele a natural yet effective array of products. Paws and Pals Shampoo has over 200 reviews and maintains a 4.5 star rating. It comes in 3 different types: argan oil, natural conditioner and original oatmeal. The ingredients of the range of shampoo offered from Oxgord are all organic and derived from plant sources. Tear free soapless formula ensures that the soap does not irritate or inflame your pets eyes and nose. 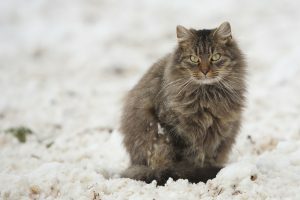 You can use Oxgord shampoos on all your pets, no need to buy separate product for cats. Bonus: no added parabens. Paws & Pals makes a ton of products for your pets. View their products here: Paws & Pals. 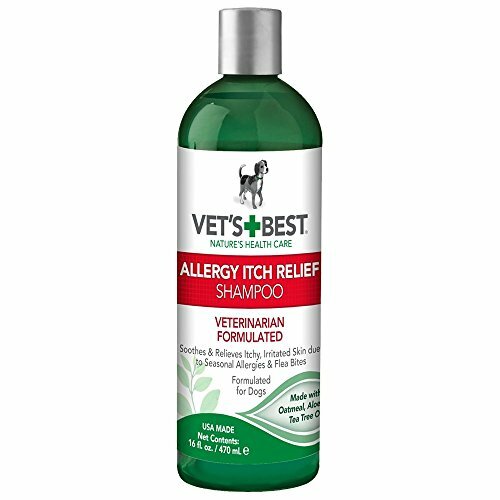 The products available in the market from Vet’s Best are specially formulated for dogs with super sensitive skin and allergy issues. Vet’s Best dog shampoo is carefully manufactured after consulting with Veterinary doctors thereby making them absolutely safe for use. The ‘no tears’ formula prevents the product to cause any sort of irritation or inflammation to your dog’s eyes or nose. The Vet’s Best dog shampoos are well balanced and have Panthenol and Allantoin as the main ingredients, complemented with Vitamin E and Aloe Vera. This uniqueness combination of ingredients makes them ideal for cleaning and moisturizing dogs with hypoallergenic skin types. Vet’s Best makes all sorts of safe pet products including flea and tick solutions and supplements for your pets. View their products here: Vet’s Best. Nature’s Miracle, as the name suggests, are the makers of all natural grooming and hygiene products. Almost all of their products are soap-free, thereby making them safe even for your puppies! The products are free from parabens, and manufactured with FDA approved colors and preservatives that are safe. This shampoo is great at eliminating and controlling odor and comes in a fresh honey sage scent. Nature’s Miracle also produces an odor and shed control shampoo, a whitening shampoo and a puppy specific shampoo for all your dogs needs. Not only that, they make a variety of odor and stain removers for pet owners. View more of their products here: Nature’s Miracle Shop. You can also purchase a large 32 oz bottle for washing multiple dogs. This does not state if you can use on cats so please, buy a separate product for your feline friends. Isle of Dogs is a company that provides premium products to dog show contests and beauty salons for pets. 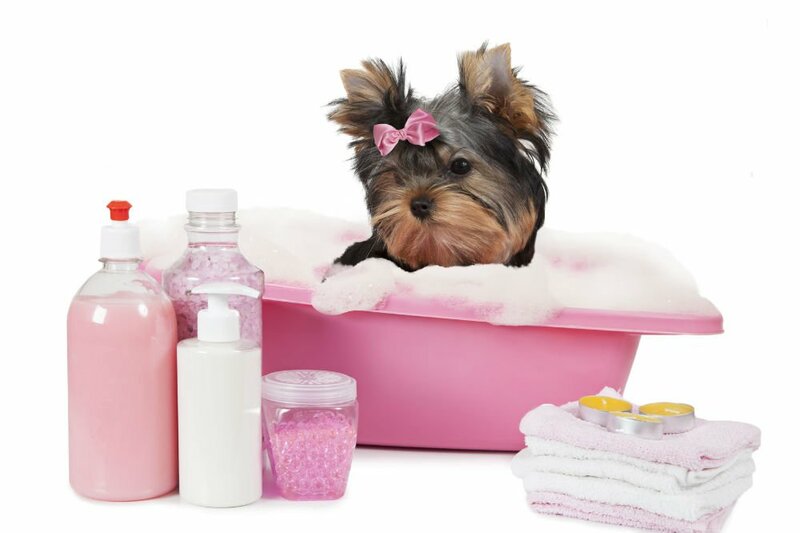 Their range of paraben free dog shampoo is not only effective but also mild enough for regular bathing sessions. Isle of Dogs offers one of the gentlest shampoos for puppies on the market and is offered at a great price. You can also purchase a large 1 gallon size if you really like it or have multiple dogs to wash. 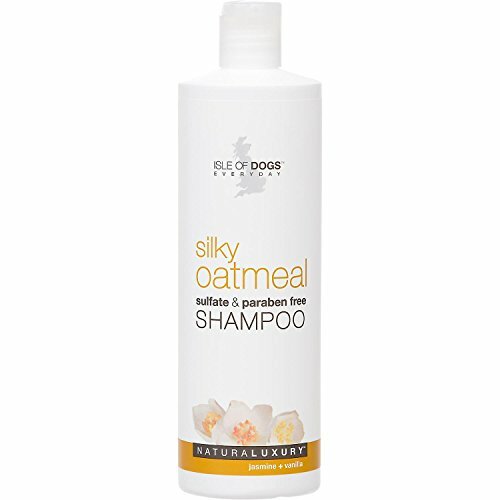 The Silky Oatmeal shampoo is sulfate and paraben free and contains natural odor neutralizers. 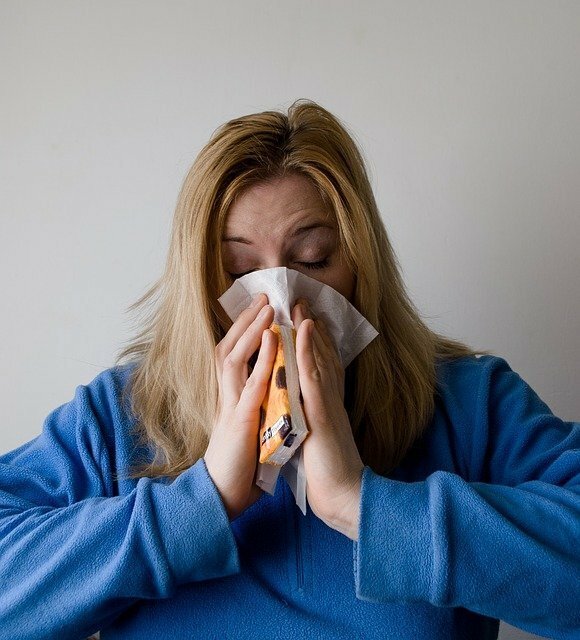 Most of the ingredients that they use are derived from homemade concoctions such as evening primrose oil, royal jelly etc. which makes it an ideal product if you want your dog to have a shiny and tangle free coat. If your dog is suffering from an irritating skin condition and has some kind of allergy on its skin, then one of the best-medicated shampoos to apply on its skin is the Douxo Chlorhexidine PS Shampoo. This is a medicated shampoo made by a reputed and established company that maintains high standards of quality and innovation in its products. This is one of the best selling shampoos and all issues with the dog skin can easily be treated with this shampoo. Your pet will get quick and long lasting relief from the skin issues that he or she has. Upon regular application of the shampoo, you will find your pet’s coat to be silky and soft to touch. Your pet’s skin will be free from dandruff and itchiness. The medicated shampoo will also help in making your pets skin healthier. It is loaded with antibacterial, antifungal and antiseptic properties that will help in preventing skin issues and allergies that your dogs and cats may have. The shampoo is very easy to apply and does not cause any harm to your pets skin. Using the shampoo regularly on your dog’s skin will help in healing the skin and preventing any skin flakes. It will protect your pets skin and make it look shiny and attractive. Your pets coat will get the necessary ingredients that it needs and will start to shine after a few weeks. The dog’s hair will be smooth and shiny. Use it two to three times a week on your pet for the first three to four weeks. You will find the lesions and skin flakes are greatly reduced with time. You should see a reduction in the amount your dog sheds as their coat and skin become healthier. Have you ever experienced the smell of a nasty, stinky dog? Especially since they LOVE to roll in garbage and dead things any chance they get. Giving your dog a bath to get rid of the famous “dog” smell is the only sane thing to do. Please keep in mind that giving your dog a bath too often is not a good idea. 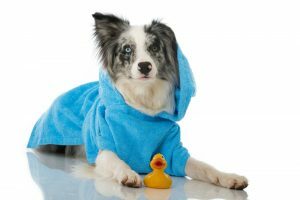 Frequent bathing can strip away the natural oils from your dog’s skin leading to dry and itchy skin. The grooming products available on the market, no matter how mild they are, can disturb the pH balance of the skin of your dog. Dog’s skin is different than humans. 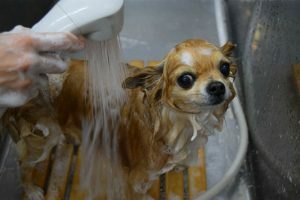 Human shampoos cannot be used to bathe dogs as dogs skin is 3 times more sensitive than ours. Therefore, the shampoo and fur care products that you must purchase are different. How do I choose a Dog Shampoo? If you have a dirty feline, you might wonder if you can use your dog shampoo on your cat. Why can’t you use dog shampoo on cats? Dog shampoos are specifically formulated with ingredients for your dogs pH balance. Dog shampoos could also contain ingredients that are harmful to your cat. Unless it states that you can use it on all your pets right on the bottle, then do not wash your cats with it. Purchase a shampoo that is formulated for cats to make sure that your cat doesn’t have a terrible reaction. Same thing for rabbits, horses and ferrets. Buy them shampoo made just for them. 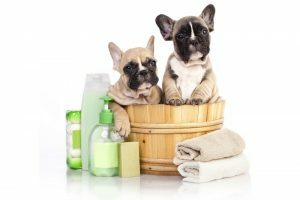 What Dog Shampoo is Best for Puppies? A dog shampoo made for puppies is going to be organic, nontoxic, gentle, and detergent/soap free. It will be even more gentle than a regular dog shampoo. That is because puppies are tiny and fragile and do not yet have their immune systems built up enough to process the types of ingredients found in regular dog shampoo. Look for a brand that is specifically made for puppies such as Wahl Home Products. This is especially true if your puppy has a skin condition or fleas. 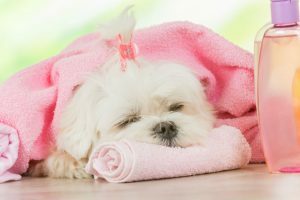 Regular dog shampoos could harm your puppy. Please note that most shampoos are for puppies 12 weeks and up. You may need to just give your puppy under 12 weeks a warm water sponge bath until they are old enough to be shampooed. Talk to your local vet if you need assistance. What is your favorite brand of dog or pet shampoo and why? Let us know in the comments below!